Sounds like a good plan! I'm not as good with the structure as the Menu Plan Monday gig....need to get on it! You've got some yums coming up this week! What are Wet Burritos?? That sounds interesting. I am curious what Wet Burritos are! Can you give the recipe on Thursday? Hope you're week is off to a great start! I am your new follower from Friday Follow. Thank you for coming by and following me. Hi there! I love your button, it looks great! Did you do it? I will try to post the recipe as time allows. Wet Burritos are the Michigan verion of enchiladas. My husband grew up there, and refuses to call them enchiladas. So, since I couldn't beat him, I joined him! 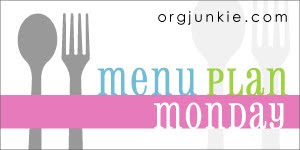 i think planning a menu is an awesome idea! Sounds fantastic...menu planning is one of the many things on my to-do list for the year.